TORONTO — Bad blood between Toronto FC and the New York Red Bulls spilled into the halftime tunnel on Sunday — and cost TFC the use of star striker Jozy Altidore in the opening game of the Eastern Conference final. Flaring tempers sparked an altercation as both teams left the field for their respective dressing rooms during halftime of the second leg of the Eastern Conference semifinal. "We've lost (Altidore) as of now," said TFC coach Greg Vanney. "There's video footage I think of what happened in the tunnel. From my estimation and from what I've heard, Jozy basically got ambushed in the tunnel and we'll see where that goes." New York won the chippy game 1-0, but Toronto moves on to face Columbus in the conference final based on away goals after a 2-2 aggregate tie. 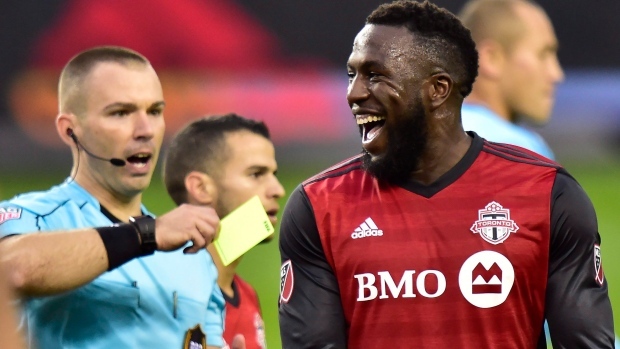 Unless the league rescinds its ruling, Altidore will sit in Game 1 of the next round after he and New York's Sacha Kljestan were slapped with red cards for the tunnel melee. Toronto FC will also be without superstar Sebastian Giovinco in its next game after the Italian striker picked up his second yellow card in as many games Sunday. Video shows shoving and yelling between numerous players on both teams, while police officers try to break up the brawl, and Vanney and TFC captain Michael Bradley confront New York coach Jesse Marsch. Dozens of fans in the Tunnel Club watched the mayhem unfold through a glass wall. Both Vanney and Marsch said they weren't informed of the red cards until some three minutes before the second half kicked off, leaving both teams to play the final 45 minutes one man down. Altidore wasn't available in the post-game locker-room. But he apologized to fans in a television interview at the Toronto Raptors game later Sunday. "It's disappointing," Altidore said. "First I've got to apologize to all the fans and all the people who came out to BMO, watching at home. He tried to come get me from behind, choked me, pushed me. He found out the hard way he shouldn't do something like that. "Look, I apologize for my actions but I had to defend myself." The scuffle erupted after a heated first half that saw Altidore and Kljestan receive yellow cards after a brief shoving match. Toronto FC said Altidore was swarmed in the tunnel, but Kljestan had a different version. "At halftime, (Altidore) shoved me into the wall," the New York captain said. "And so I have a clear conscience. I don't feel like I deserve a red card, so it's a pretty helpless feeling not to be able to play in the second half because of that." Toronto's players, however, questioned why the Red Bulls were in their section of the BMO Field tunnel at halftime in the first place. "I came in late and it had already boiled over by the time I came in," said Toronto defender Drew Moor. "Their entire team was in part of the tunnel. Guys were trying to separate other guys. It had clearly been a lot more chaotic than what you usually see at halftime." Toronto captain Michael Bradley was also late to arrive on the scene. He'd stayed on the pitch to argue with an official, resulting in a yellow card of his own. "I came in and saw the scuffle, there was 25 people involved," Bradley said. "So I can only go by what the guys in here say, and that's that Jozy was walking in towards our locker-room, a few of their guys come after him. "And the first question is what are they even doing here, because the way that this tunnel is set up, they shouldn't be anywhere close to the entrance to our locker-room. They walk a few feet inside the tunnel and then turn left to go down there long hallway toward their locker-room. We keep walking straight. So right away, it seems to me that there's a problem." Vanney said there's never been a halftime incident in his time with TFC. "Jozy was followed in, basically confronted," the coach said. "He turned around and my understanding is the next thing you know there were four, five, six Red Bulls people all rushing at him, towards him, at the same time."